(Bloomberg) -- It took an almost $25 billion rally, but Walt Disney Co. has won over one of its biggest bears given its foray into video streaming. BTIG LLC upgraded the stock to neutral after having maintained a sell rating since December 2015. Shares of the media company climb as much as 1.8 percent as of 10:50 a.m. in New York, on track to extend record highs. Analyst Richard Greenfield says the Disney narrative has shifted "for now," as he applauds Chief Executive Officer Bob Iger for realizing "the need to put the consumer first versus historically" prioritizing business models and profits. "Building a direct relationship with consumers will create opportunities for Disney that extend well beyond the streaming service through leveraging first-party data that Disney has never had access to," he wrote in research note, removing the firm’s $90 price target without providing a new one. 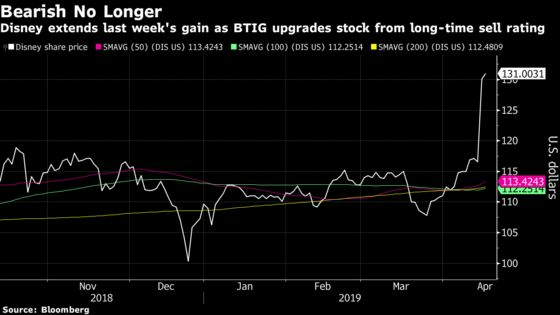 BTIG is the latest to turn more bullish after Disney’s analyst day from last week. So is Imperial Capital’s David Miller, who said the event was "extremely well-received by [the] investment community" as management answered key questions for Wall Street spanning price points and potential for bundling. The firm raised its price target to $139 per share from $129.